Sophie Falsini presents a fascinating analysis of the current state and future prospects of Ukrainian civil society in light of the 2013–2014 events. Since then, the country has been shaken by both sociopolitical disorders and a deep humanitarian emergency, also exacerbated by the crisis of internally displaced people. Yet it is under these same premises that civil society emerged as a main actor in post-Euromaidan politics, development, and reform. Through its war relief work and the endeavors to lead Ukraine towards democratization, civil society has, to a considerable degree, offset the lack of an efficient state administration and activated vital components of Ukrainian social capital. 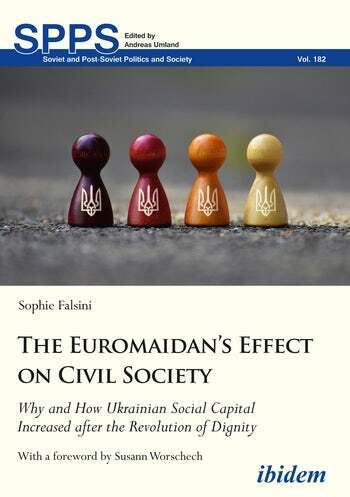 Falsini explores the way and the extent to which the events occurring in Ukraine since late 2013—the Euromaidan revolution, the annexation of Crimea, and the war in the East—have contributed to the growth of social capital as well as to the resulting change in the shape and in the structure of civil society in the country. Through a multidimensional approach, combining theoretical interpretation with empirical analysis, the study examines Ukraine’s transformed civil society in terms of its social relations, societal networks and resources, and collective action. Based on the theory of social capital after Lin Nan, the empirical analysis revolves around the case studies of 12 civil society organizations active in providing help to internally displaced people. Semi-structured interviews were conducted in Kiev, Dnipro, and Kharkiv aiming to confirm or discard the thesis of a post-Euromaidan civil society powered by increased levels of social capital. The collected data show that the 2013–2014 events did indeed contribute to the reshaping of the structure of Ukrainian civil society as they reversed people’s preference for informal and cross-level networks, mistrust towards the system, and disappointment with public institutions. Compared to the past, Ukraine’s "civil society 2.0" saw the rise of grassroots and voluntary movements which triggered social mobilization, and a long-term investment of resources for the benefit of the public good. These developments have significantly contributed to an increase of the level of social capital in post-Euromaidan Ukraine.